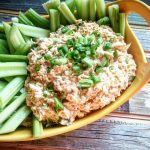 a lightened up twist on buffalo chicken dip! In a crock pot add all of the ingredients above except for the chopped green onions. Mix together well. Let heat in crock pot for about 1 hour on low or until the cheeses are melted together. Mix in green onions and serve. Servings size: 1/4 cup (packed). 2 Smart Points. 3 Points Plus. 110 Calories. 3g fat, 1.5g sat fat, 4g carbs, 1g sugar, 16g protein. Daily Dose Tip: If serving at a family gathering or party this dip is best kept warm. Turn crock pot to warm and stir from time to time.